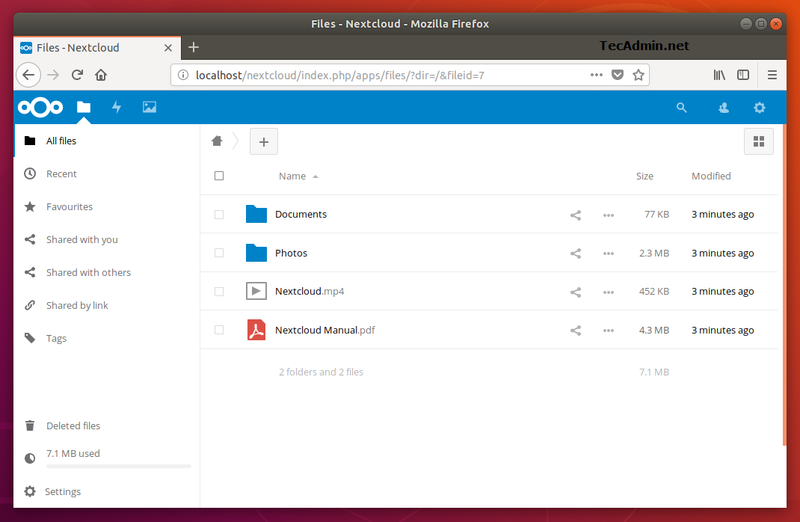 Nextcloud provides data access using web interface. It also provides options to sync and share across devices—all under your control. 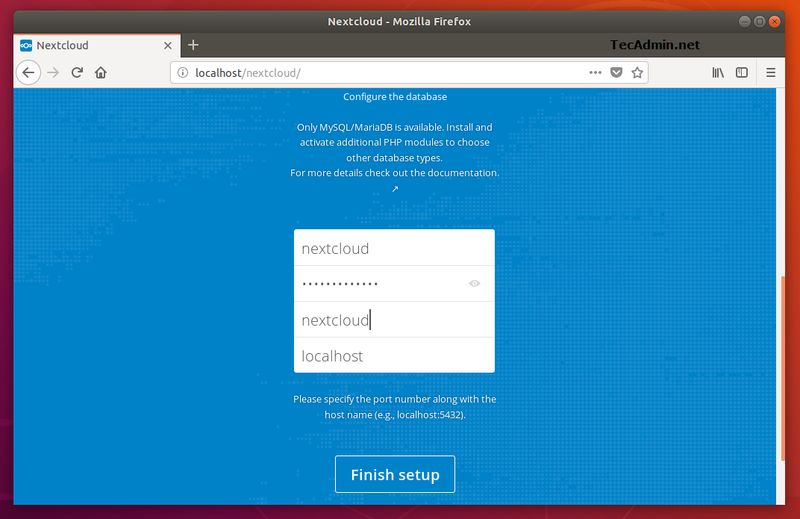 This tutorial will help you to install Nextcloud on Ubuntu 16.04 LTS Xenial Linux operating system. The first of all, to set up Nextcloud you must have running LAMP server on your Ubuntu 18.04 LTS Bionic system. If you already have running LAMP stack skip this step else use the following commands to install it. Let’s start with the installation of PHP version 5.6 or higher version on your Ubuntu 16.04 LTS Xenial systems. After successfully configuring lamp server on your system, Let’s download latest Nextcloud from its official website. Now extract downloaded archive under website document root and set up appropriate permissions on files and directories. After extracting code, let’s create a MySQL database and user account for configuring Nextcloud. Use following set of command to login to MySQL server and create database and user. 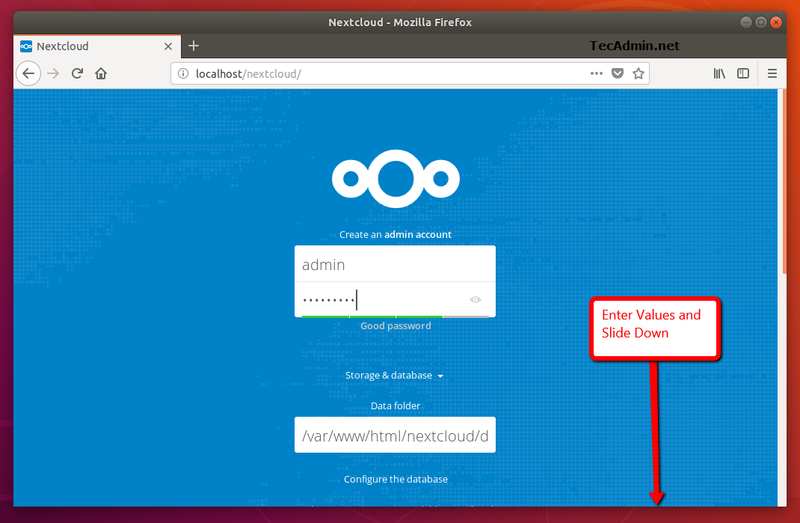 Access the Nextcloud directory in the web browser as below. Change localhost to your server IP address or domain name. After completing setup you will get admin dashboard. Where you can create a user, groups, assigned them permissions etc. Congratulations, You have a working Nextcloud instance on your Ubuntu 16.04 LTS Xenial system.